My daughter and I hadn’t done one of our big grocery shopping trips since November 12th but we finally found time for a trip Tuesday. We couldn’t have picked a nicer day for it. It was sunny and around 60 degrees which is just about perfect for a major shopping day. We started out by dropping off several months worth of glass recycling. I hoped no one would notice how much I had and discreetly slip me the contact information for the nearest AA meeting location. Then we met up with Lisa’s friend, Audrey, for an amazing lunch at Scratch. We all three opted for the pulled pork sandwich on homemade Hawaiian sweet bread. Delicious! We enjoyed a leisurely lunch and didn’t actually start our shopping rounds until a bit after 2 p.m.
We went to six stores plus a final stop at a pet store so I could get a couple of goldfish. Our goldfish, which we had for years, died a couple of years ago and the aquarium has sat empty all this time. I am determined to tackle a bunch of things I have been procrastinating about and that was one of the things on my list. Neither of us were hungry for dinner even after all that shopping but Lisa had this absolutely brilliant idea which involved cherry cheese pastries and hot tea at Panera Bread. I like the way that girl thinks. It was a wonderful day other than our sad collision with a daredevil of a raccoon on our way home. It remains to be seen how much the repair to our bumper will be but I’m fairly certain we came out ahead compared to the raccoon. It was a dark, two lane highway and nowhere to turn around and check on the little guy. When I mentioned this to David he asked me what (in the world!) I thought I could have done about it. I think he envisioned me putting an injured wild animal in the back seat and taking it to a vet. Or perhaps he thought it would turn out something like this. Silly man. I informed him that I wasn’t stupid but if the poor thing were lying there suffering I might have tried to find someone nearby to put it out of its misery. He then points out that knocking on people’s doors after dark,in the country, and asking if they have a gun might not be such a great plan, either. Whatever. 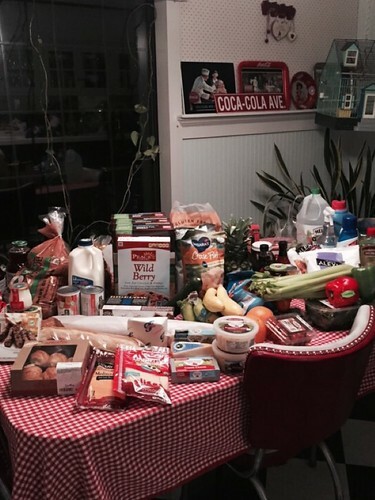 So, anyway…here is my grocery haul for February. I won’t need to order from the coops this time around as I’m well-stocked. In fact, other than fresh produce and dairy I don’t know that I will need much of anything else for a couple of months. That’s always such a good feeling, especially in the winter when my hermit tendencies kick in.